The opening scene of the Oscar-nominated African drama, Timbuktu, has a gazelle being chased by men in a truck with guns. “Don’t kill it, Tire it,” one instructs. The scene is a metaphor for how the jihadists who have come to the Malian town want to take over the people, banning smoking, and music, and demanding women wear socks and gloves, and that men roll up their pants. The abuse of power is meant to tire the citizens who have not fled, and yet, the defiant responses—of the women in particular—provide the Timbuktu with its emotional core. When the jihadists reprimand a woman who sells fish without gloves, she refuses, and dares them to cut off her hands. In another scene, Satima (Toulou Kiki) is asked to cover her head by jihadist, only to respond that they should simply not to look at her. A third scene, shot from overhead, shows Zabou (Kettly Noël) stopping a truck with her outstretched arms. These moments illustrate how the villagers are fighting against an oppression without fear. Director Abderrahmane Sissako draws out the difficulties in his characters lives with subtlety. One of the film’s tragic storylines involves Satima’s husband, Kidane (Ibrahim Ahmed). Hoping to give his cattle to his adopted son, Issan (Mehdi A.G. Mohamed), his plans are ruined when Issan loses control of one of the animals, and the local fisherman Amadou (Omar Haidara) kills it. A situation soon escalates and there are dire consequences for Kidane’s family. Sissako masterfully shoots a key sequence in this story from a distance, magnifying the physical and emotional struggle the characters undergo. It is heartwrenching. 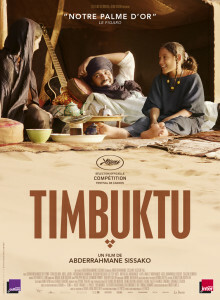 As with his previous film, Bamako, Timbuktu features a talky courtroom scene as a centerpiece, and here the narrative addresses issues of fate and faith, tradition and justice, which are all bound together in the lives of the characters. While Timbuktu does feature some intense and difficult scenes—there is a stoning sequence, the whipping of a woman, and the aforementioned death of an animal—Sissako never milks these dramatic moments to manipulate viewers’ emotions. They are shown to depict the dangers and repercussions of the jihadists’ actions, just as his film’s early scenes capture the rhythm of life in the village. Timbuktu circles back to the gazelle at the end of the film, reinforcing the powerful metaphor of the people being portrayed. Sissako’s beautiful, sensitive drama—gorgeously lensed by Sofian El Fani—is remarkably affecting. Tumbuktu opens in Philly area theaters today.